Ever wondered when nail polish first came into vogue or how women took care of their nails at the turn of the century? NAILS delves into the roots of modern nail care with a look back at the last 200 years of the nail industry. 1830: In Europe, a foot doctor named Sitts adapts a dental tool for use on nails, resulting in the invention of the orangewood stick. 1879: American Hairdresser, the first beauty trade magazine (which would later become American Salon), publishes its premier issue. 1880: Following the cues of reigning beauties Sarah Bernhardt and Lillie Langtry, women tint their nails and skin with food colorings and berry juices — but only in privacy, due to the rigid social rules of the time. 1892: Dr. Sitts’ niece brings nail care to women, and the Sitts method reaches the United States. Salons spread and cater to women of different incomes. 1896: In just a few years, manicure parlors proliferate. While a number of large manicuring establishments exist, “visiting manicures” are catering to a growing home-visit population. “Of the greatly increased number of persons who have their hands attended to by professional manicures, a considerable number now have the work done at home,” reports the July 17 edition of the Daily Nevada State Journal. According to the article, as many men as women have their nails cared for by professionals. 1900: Women clip and shape their nails with ornate sterling silver and gold scissors and metal files, then massage them with tinted creams or powders. A glossy nail varnish applied with a camel hair brush hits the market, but wears off in a day. 1904: The Barber Supply Dealers Association of America (which becomes The Beauty and Barber Supply Institute in 1921) holds its first convention at the World’s Fair in St. Louis. Manufacturers and distributors of beauty care products meet and develop relationships. 1905: In these pre-disposable days, manicure implements were themselves works of beauty. An ad for “High Grade Manicure Requisites” in the April 13 edition of the New York Times, offers “every conceivable requisite, of finely tempered steel, with handles of exquisite pearl, Alaska ivory, bone, and rare woods, such as fox, satin, para, and ebony.” Polpaste, described as “a brilliant nail polish,” can be had for just 14 cents. Chafed by dry skin? W.T. Fernie advises women to seek relief by applying snail slime to smooth the rough spots. 1914: The Industrial Revolution sparks inventive solutions to new problems. Anna Kindred of North Dakota files a patent for a fingernail shield designed to protect the nails from the discoloring effects of chemicals. 1917: “Don’t cut the cuticle,” warns an ad in the November 1917 Vogue. Instead, suggests Dr. W.G. Korony in Louisville, Ky., “Employ the Simplex Method of Home Manicuring — requires no tools.” The Simplex Sample manicuring “outfit” includes cuticle remover, nail polish, nail enamel, nail whitener, orangewood stick, emery board, and a booklet of “home manicuring lessons.” Women continue to buff their nails with cake, paste, or powder. Formulations such as Hyglo Nail Polish claim to be brilliant, lasting, and waterproof. Cutex busily builds a brand portfolio, offering cuticle remover, nail white, and cuticle comfort. And while nail color is limited to pink, women have their choice of cake, paste, powder, liquid, or stick forms. Get a complete manicure set for 14 cents. 1920: Screen stars favor a waif-like look, with short hair and slender figures. Nails are still unpolished, but the coming development of automotive paint paves the way for today’s nail enamels. 1921: The National Hairdressers Association forms, later changing its name to the National Hairdressers and Cosmetologists Association, then the National Cosmetology Association (NCA), as it’s now known. 1922: Beauty Culture magazine publishes its first issue in New York. 1924: The Association of Accredited Cosmetology Schools (AACS) forms to rally factions of the cosmetology industry around the common goal of furthering education in cosmetology arts and sciences. 1925: A sheer, rosy red nail polish enters the market, sparking what Beatrice Kaye, manicurist at MGM Studios, called the “moon manicure.” Polish is applied over the pink portion of the nail bed, leaving the free edge and lunula bare. The look gains staying power, holding on until the mid-30s, but evolves into an edgier look with cut cuticles and pointed free edges. Popular etiquette books of the time caution women against painting their nails “garish colors.” Max Factor accommodates society’s mesdames with MaxFactor’s Society Nail Tint, a rose colored cream packaged in a small porcelain pot. Buffed into the nail plate, nails take on a natural rose hue. Coupled with Society Nail White, a chalky white liquid applied to the underside of the free edge, the finished look resembles today’s French manicure. Max Factor also offers cuticle cream and cuticle remover. 1930: Ladies of the silver screen popularize cosmetics, including nail polishes. The overall look is one of cool sophistication and elegant, immaculate grooming. The moon manicure thrives in various intensities of red. Women shape their pointed nail tips and clean under their free edges with an early electric filing and buffing machine, a pen-shaped wand with an attached cord. 1932: Charles Revson, with his brother and chemist Joseph Revson, and Charles Lachman, creates the first pigment-based nail polish. Opaque and non-streaking, pigments also make possible a rainbow of colors. The company became Revlon. 1933: Actress Dorothy Hess is one of the first to experiment with an electric manicure set introduced at the American Beauty & Styles exposition. 1934: According to the January 25 edition of the Coe College Cosmos (Cedar Rapids, Iowa) newspaper, not everyone approves of the advancements in cosmetics and nail products. “Fully one-third of the masculine element at Coe does not believe that a girl’s appearance is enhanced by wearing lipstick and nail polish.” Anna Hamburg of California is granted a patent for an artificial nail easily applied and removed from the natural nail with no damage. Maxwell Lappe, a dentist in Chicago, creates Nu Nails, an artificial nail for nail biters. Max Factor’s Liquid Nail Enamel, the grandfather of today’s polish formulations, adds splashes of red to store shelves. 1935: Eugene Rohrback of New Jersey patents a nail covering that slips over and under the free edge, eliminating the need for glue. 1936: Stella O’Donnell of New York patents a finishing stencil for polish. Placed over the nail, the stencil helps users achieve consistent coverage. As interest in the moon manicure wanes, “Paris Nails” (painted a deep pink at the edge, fading to pale pink over the nail bed) rise in popularity. 1937: Harriet Fligenbaum of Minnesota receives a patent for her method of using tips to repair and lengthen nails. 1938: Despite the times, manicurists had little to be depressed about with clients happily paying anywhere from 25 cents to $3.50 for a manicure. Base coat promotes polish adhesion, further increasing the demand for manicures. Polish also spreads to toenails around this time. 1940: Rita Hayworth’s long, red nails reshape fashion. Longer than previously fashionable, Hayworth favors a softer, oval shape and polishes her glamorous look of a worldly seductress in red. For the past 40 years, men have had most of the manicures. But as women enter the workforce, some of their earnings go to manicures and nail polish. Frank Nolon of New York patents an appliqué for nail designs. The introduction of manicure shields allow the manicurist to paint a client’s nails while she sits under the hairdryer without heat damage. Other patents issued in 1940 include cuticle guards and protective nail coverings. Elizabeth Arden Salons sell Schoolhouse Red nail polish for 75 cents a bottle (rouge and lipstick can be tinted to match). Clear polish brushed over and under enamel extends the life of a manicure. Decades before fiberglass and silk wraps entered the market, enterprising manicurists repaired broken nails with trimmings of teabags and coffee filters and Duco cement, says Beatrice Kaye. 1943: The Long Beach Hairdressers’ Guild holds its first show. 1945: Max Factor debuts Satin Smooth Nail Polish, an improved formulation of its Liquid Nail Enamel available in reds, pinks, and other colors. 1948: Noreen Reho of Missouri designs an apparatus to hold manicure implements. 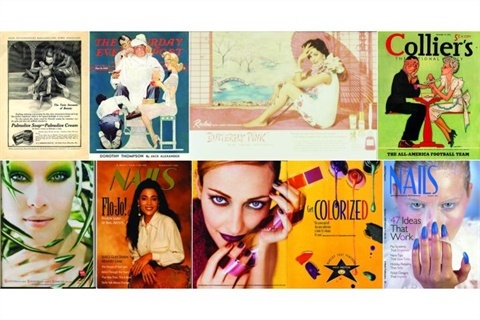 1950: An ever-growing palette of nail colors promotes a more delicate looking nail. Dark colors and pointed tips soften to light colors and oval shapes. Eyes catch the most attention, while nails and lips take on supporting roles. A Vogue ad promotes a kit containing nail polish, lipstick, and lip liner for $1.60. Nail care classes in the ’50s focused on basic manicure techniques, says Norma Keown of Philadelphia. “You had to polish leaving the moons and hairline tip free,” says Keown. “We made the hairline tip by putting polish on the nail, then taking our thumbs and running them across the tip.” Revlon provides a student kit outfitted with the basics. With mostly hairdressers providing manicures as a secondary service, companies had little demand for more. The nail industry borrows aerosol technology to innovate spray-on polish dryers. Juliette Marglen introduces the first nail wrap system. Sold in sheets bundled into matchbook-like packaging, manicurists trim the material to cover only the top third of the nail. When celebrities endorsed the Juliette Manicure as a “natural nail enhancement,” consumer demand skyrocketed. 1957: Thomas Slack wins a patent for a “platform” that fits around the nail edge. Soon dubbed “forms,” manicurists use them to apply the first acrylic extensions over nails. This first system, also manufactured by the Slack family, is named Pattinail after Patricia Still, who developed the technique and demonstrated it in department stores. The Slacks went on to form NSI. 1959: Max Factor’s Nail Enamel enters the market. 1960: Coral-tone polishes are the rage, but women have their choice of nearly every color under the sun. Artificial nails gain a finger-hold in the market as Mona Nail in Dallas manufactures one of the first acrylic systems developed specifically for use on nails, and linen wraps (found to be much stronger than paper wraps) gain popularity. Manicures, however, still reign supreme. A Hot Lactol Manicure can be had for a $1.50 at The Fawnwood Beauty Salon in Panola, Texas. While a few salons today still call it a Lactol Manicure, a “treatment that soaks hands in dish of warm milk or moisturizing solution to soothe and smooth skin” can be found in any nail salon. 1970: Artificial nails gain cachet as an overt sign of wealth and luxury. Long, thick, and opaque, artificial nails cultivate beauty with one of the hundreds of polish colors now available. Around this time, Donna Kohl, a nail technician in Boise, Idaho, says cigarette and perm papers reinforced with airplane glue replaced teabags and coffee filters for strengthening nails. 1972: In the early ’70s, acrylics arrive in America’s Heartland. Phyllis Monier, a Chicago pioneer, introduces her Nike line of acrylic powder and liquid in Chicago.